Last night I saw La Grande Illusion. This is a 1937 movie about French soldiers captured by the Germans during WW1. There are several occasions in which the French soldiers try to escape their prisons, the ideas for which were later taken for several "escape" films. But this is not purely an escape movie. The film casts an observant eye on the class differences between the soldiers (especially between the noble-born officers and working-class soldiers) and how these differences are to them greater than the differences in nationality or religion. The movie does not explicitly show the cruelties of war, and the interaction between the prisoners and their German soldiers is generally of a chummy nature or at least showing mutual respect (most striking here is the cameraderie between Pierre Fresnay as the highborn French officer de Boeldieu and Erich Von Stronheim as the aristocratic German captain von Rauffenstein). Rather, it depicts the futility of war by showing how the people involved in fighting these wars do not have any inherent hatred or ill feeling towards each other, and it is the arbitrariness of those in power that pulls them into conflict. While La Grande Illusion is on the sentimental side, it is not preachy. There is a cautiously optimistic message that at the end of the war, people will once again learn to live with each other. Of course, this hope was undone 4 years after the film was released with the advent of WW2. 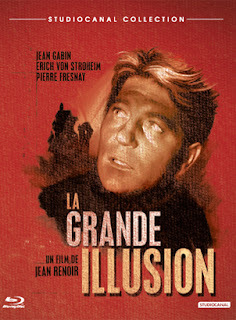 La Grande Illusion was banned in Germany and Italy (of course), but was a major success wherever else it was released. Audiences identified with the essential decency of the characters and the anti-war sentiment. A cross-border love story that blossoms towards the end of the film is especially poignant. I would really like to see India make a war-time film like this instead of just the ones that go rah rah patriotism. Studio Canal's blu-ray of La Grande Illusion features an impeccable presentation. Unlike the previous Criterion DVD release which from screenshots now appears digitally sharpened and cropped on all sides, this BD uses a newer 4K restoration sourced from the nitrate negative and the image is simply stunning. Terrific depth, deep (but not boosted) blacks and such minimal grain that one could almost suspect noise reduction if not for the terrific detail. There are occasionally soft scenes but none that seem a by-product of digital manipulation. The French audio track (DTS-HD MA 2.0) is clear and does the job, though as expected for a movie of this vintage, not especially immersive and the highs in the background score jar a teensy weensy bit for me. There's a boat load of extras which promise to be interesting, but I have not seen any other than the (very nice) lengthy video introduction/essay by French movie critic Ginette Vincendeau (who seems to be the go-to person for video essays on Arrow and Studio Canal releases of French movies).